This Excel tip will show you how to display the current time within any Excel spreadsheet. This is a useful function if you need to let the user know just how much time left the have to do something or simply to inform them of the current time. Examples include creating forms with Excel, reports with Excel, presentations with Excel, etc. The standard NOW() function will return the current date formatted as MM/DD/YYYY and the time formatted as hh:mm. This means that it does take a little bit of formatting to get this function to display the time without also displaying the date. Type "=NOW()" into the cell which should display the current time and hit the enter key. 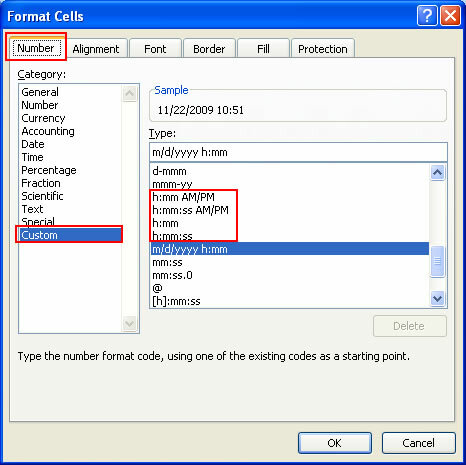 Right-click the cell in which you just entered the above formula and click "Format Cells...."
Navigate to the "Number" tab; by default, you should already be on that tab. Make sure you are in the "Custom" category along the left side of the window and then in the right side of the same window select "hh:mm" or "hh:mm:ss" to display the time with or without also displaying the seconds. Note: The "hh:mm" and "hh:mm:ss" options should be right above the default selection option.